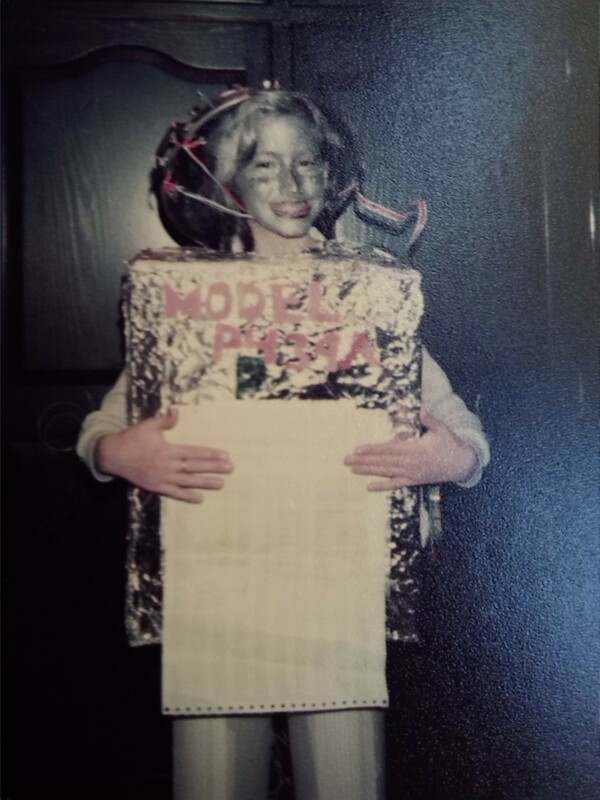 I am so glad that I don’t have to come up with Halloween costumes for my children any more. Not that I ever did. When it comes to being creative in that way, my imagination draws a blank. Each year, I would plead with them to come up with something imaginative; each year they exceeded even my puny expectations. There was only one time when I actually made a costume for Lewis. I was teaching math in high school at the time and ideas for the upcoming holiday were being bandied about in the math department. 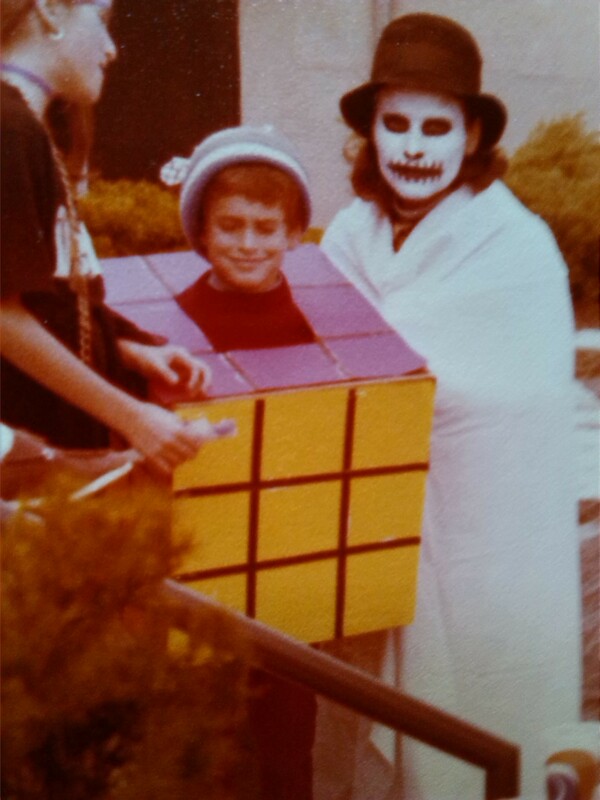 “Do a Rubik’s cube,” my friend suggested, “you take a box, cut out a head hole, and draw or paste on squares!” I could do that! Here’s how it came out. And there, next to him, am I, in face make-up that another teacher gave explicit directions for. She even drew them on paper for me. Obviously, I couldn’t come up with something to wear, so draped a sheet over myself. Next we see a costume conceived of and made entirely by Jordana. On her head is my colander. She is computer model P439A, complete with computer printer paper (remember the feed holes?) and silver paper wrapped around her legs, I believe she won a town-wide contest with that creation! Next is the rootin’ tootin’ cowboy that Lewis came up with. I have no recollection of where he got that outfit but it certainly is authentic looking. With a face too sweet for anyone to be frightened of, he makes a handsome cowboy! And, finally, here’s Jordana again with an outfit she completely and independently came up with. 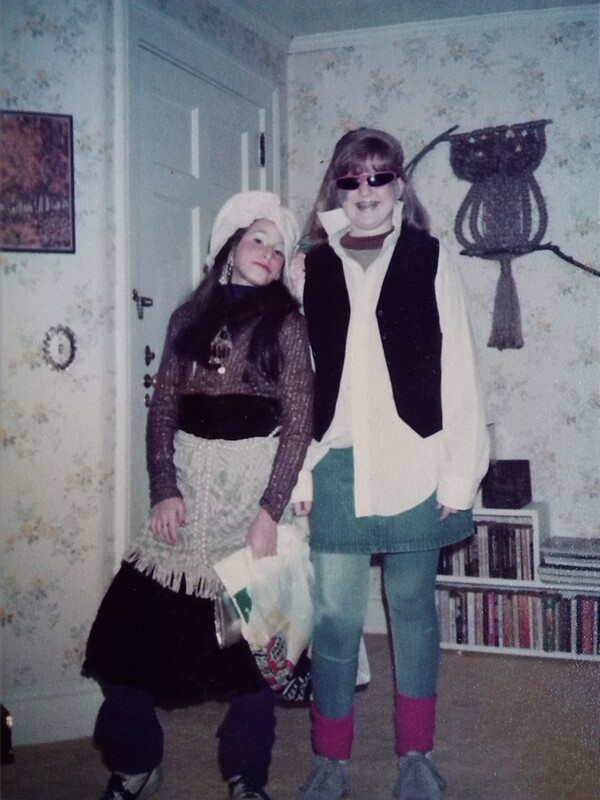 One can see my dangling rhinestone earrings, my mother’s fur wrap around her neck, a floppy hat and a lace skirt to top off the long black skirt. Lipstick, rouge and eye shadow complete the image. In her hand is the Trick or Treat bag (from Stew Leonard’s, a local store) to gather her goodies. So, I’ve survived my Halloween nightmare by mostly staying out of it. 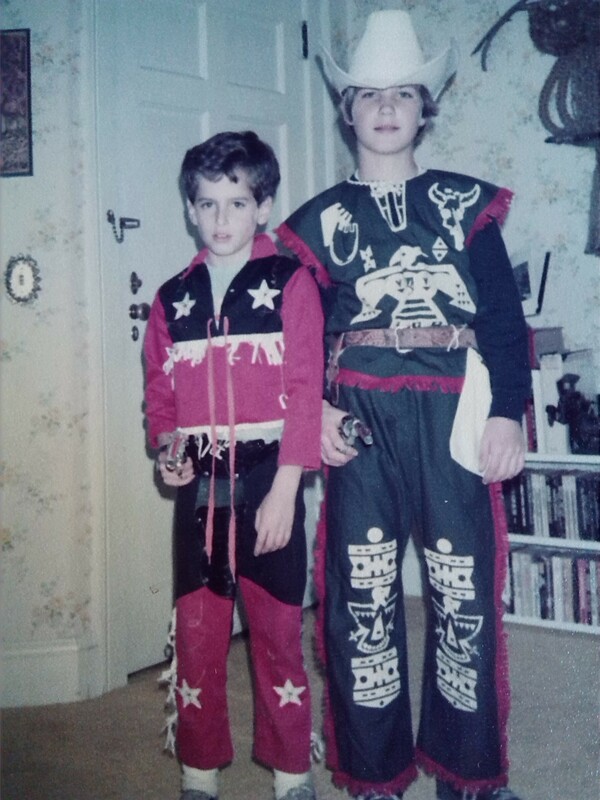 Yes, I supply some candy, encouragement and scary music, but as for creative costumes, I left that – with great success – to my two children. Great job, guys!